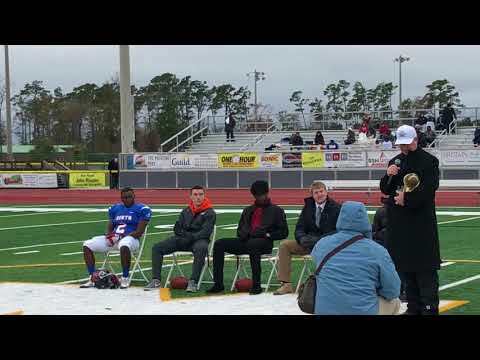 Fort Dorchester High School quarterback Dakereon Joyner was named South Carolina’s Mr. Football during halftime of the Touchstone Energy Cooperatives Bowl, North vs. South, on Saturday in Myrtle Beach. Selected from among five distinguished finalists, Joyner was recognized for his hard work both on and off the football field. "Since I was little, my granddad, who passed away when I was little, always said I would be a football player," said Joyner. "I just love it. It's natural, you know. I happen to be good at it. God gave me this gift, and I'm grateful." Presenting the Mr. Football trophy to Joyner was Bob Paulling, CEO of Mid-Carolina Electric Cooperative, and Willis Sanders, a trustee at Berkeley Electric Cooperative, which serves areas near Joyner's high school. Joyner has committed to the University of South Carolina, where he'll compete with Jake Bentley for playing time. Highlights of Joyner's career include leading his teammates to their school’s first state championship in 2015 and being named Palmetto Champions Back of the Year. "Dakereon is the most unique football player, and person, I have been associated with," said Steve LaPrad, Fort Dorchester's head football coach. "He is by far the best player I've coached, but he is an even better person." Other Mr. Football finalists were Newberry’s Amir Abrams, Chapman quarterback Colton Bailey, Spartanburg linebacker Connor Shugart and Spring Valley linebacker Channing Tindall. Joyner will play in the 81st annual Shrine Bowl on Dec. 16 at Wofford College. The South Carolina Athletic Coaches Association annually presents the Mr. Football award to the state’s top high school football player. South Carolina’s electric cooperatives are the primary sponsors of the Touchstone Energy Cooperatives Bowl.